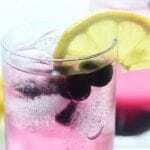 This Blueberry Rum Spritzer absolutely falls into the category of easy and fun alcoholic drinks to make. It is light and refreshing with loads of blueberry flavor and a hint of lemon. Place blueberries, sugar and water in a medium sized sauce pan over low heat until sugar is dissolved, stirring often about 5 mins. Raise heat to medium/high and continue stirring often. Cook until blueberries soften and begin to break apart, about 15-20 mins. Take off heat and stir in lemon juice. Place a mesh colander over a large glass bowl and pour blueberry mixture through colander. Using a large wooden spoon break apart cooked blueberry extracting as much blueberry juice from them as possible. Refrigerate Blueberry syrup covered in a glass container until thoroughly chilled, about 6 hours. Place desired amount of ice in each glass. Pour 1-2 shots of rum over ice. Add in 1-2 tbsp of blueberry syrup over rum and ice. Pour in 8-12 oz of sparkling water. Garnish with lemon wedges and blueberries.